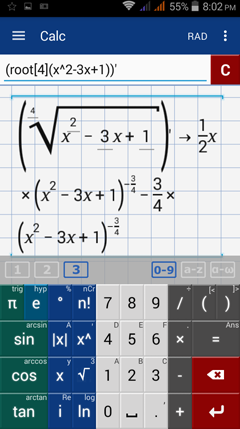 Since it's easy to make a mistake taking a derivative by hand, you can check your work using the app. Type the expression as it appears in the problem. Find the first derivative of each function below. Note: You don't need to type f(x) since it's implied. Enter the expression in parentheses and take the first derivative by tapping the exponent key (x^n) twice. 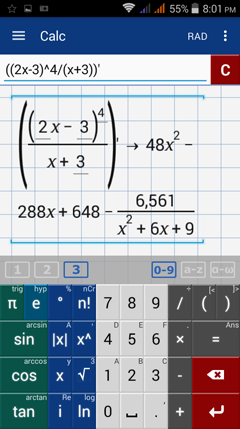 Find the 4th root by typing "root" using the a-z​ keyboard. Place the index in brackets and the argument in parentheses, Type brackets by tapping the parentheses keys twice.